← Has Royal Camera moved beyond bait and switch? I have such a thing about hard, shiny tools that Gretchen has to drag me away from the tool displays in places like Lowes and Home Depot. When I saw this hammer at the recent Winterfest Arts and Crafts event at the Jacksonville Center, I was instantly hooked. Gretchen wasn’t with me and the combination of a well-made hammer and the marlinspike knotwork was too much to resist. 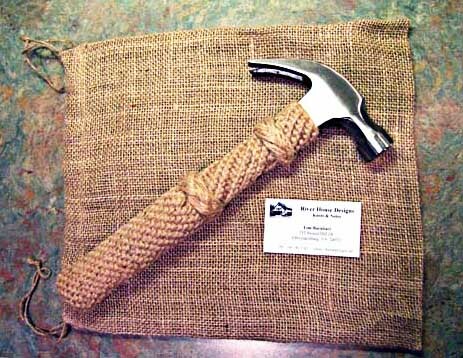 I just had to have this one-of-a-kind tool, so I purchased the hammer from Tom Barnhart and he gave me a jute bag to take it home in. When I showed Gretchen the hammer and saw her eyes light up, I suddenly realized that she would make better use of it than I would and the hammer would be kept and cherished as an "inside the house" tool. I presented it to her with only the slightest quiver of regret and she has been happily using it ever since. 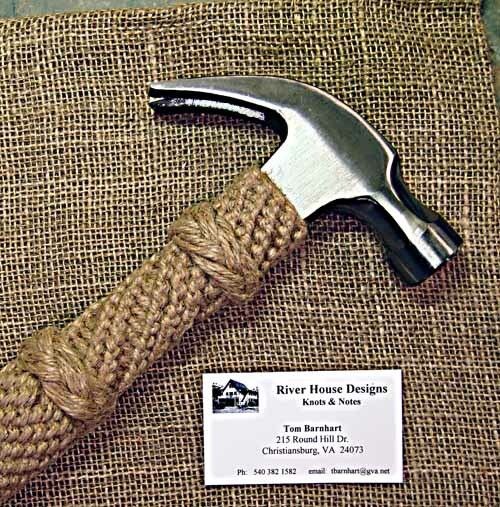 Tom Barnhart of River House Designs in Christiansburg is a practitioner of nautical knotting which has a long and colorful history. He learned this skill while in the US Navy back when knot work was a required skill. His display at Winterfest had many examples of beautiful knotwork. Here is his card for those of you who would like to see more of his work.